Fitzpatrick Glass Studios transforms sacred spaces with visually stunning art glass that provides an enduring testament to your values and beliefs. From places of worship to sacred spaces within private homes, Fitzpatrick creates beautiful stained glass windows drawing on your input and our design and art expertise. After we receive your approval on the design, we fabricate your windows in our professional, fully equipped studio. We finish the project by installing the glass art using the highest industry standards. We are dedicated to providing superlative customer service. Fitzpatrick’s clients can attest that projects are completed within budget. 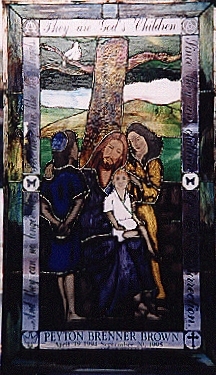 We promise to give you the same high service when we create art glass for your sacred space. Please review a few samples of our work below. For more information, please contact Fitzpatrick Glass Studios at 301-460-6404 or info@fitzpatrickglass.com.